Founded in 1957, the Xinjiang Astronomical Observatory (XAO) of the Chinese Academy of Sciences (CAS) has developed into an important and comprehensive astronomical research organization in the past few decades. The areas of current research include radio astronomy, optical astronomy and astronomical applications, covering such areas as pulsars, star formation and evolution, particle astrophysics，structure and control of radio telescope, galaxies and cosmology, high-energy astrophysics, microwave receivers, digital technology, GPS, and so on. The Radio Astrophysical Laboratory of XAO, which is one of the key radio astronomy laboratories of CAS, and it also known as a key laboratory of the Xinjiang Uygur Autonomous Region. The Nanshan station also plays an important role in China's Lunar Exploration Program. 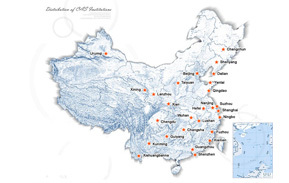 XAO maintains and operates three field stations including Nanshan, Kashgar and Qitai, and two other independent ground stations. Additionally, XAO is currently equipped with a 25-m radio telescope, a 1-m wide-field optical telescope, a solar photosphere/chromosphere telescope and a GPS receiver system. In addition, a project to build a large 110-m fully steerable single- dish radio telescope, known as the Steerable 110-m Aperture Radio Telescope (SmART), or Qitai Radio Telescope (QTT) in Qitai County, Xinjiang, is currently in progress. XAO has established close cooperation with many universities and institutes in China, such as Peking University, Nanjing University, Xi'an University of Electronic Science and Technology. Moreover, it has cooperated with astronomical institutes in nearly 20 countries, such as the United States, Australia and Germany. Xinjiang Astronomical Observatory has doctoral and master education which is first-class discipline of astronomy, and has two subjects of astrophysics, astronomical technology and methods for doctoral and master’s degree. There is an "Astronomy" First-Level Discipline for post-doctoral research mobile station, which is now open to recruit postdoctoral research for overseas. (1) Having a PhD degree or PhD graduates. (2) Excellent in character and learning, be in good health, has team spirit of cooperation. (3) With professional background related to research direction, can independently engage in scientific research work, has strong scientific research and innovation ability, good expression and communication skills. (4) For those doctors who is over age, working or graduated from XAO, Please contact our post-doctoral management in advance. (1) During the post-doctoral period, basic research start-up funds will be provided; wages and welfare benefits will be implemented in accordance with the relevant provisions of the national post-doctoral program and the relevant provisions of the Xinjiang Observatory; Given priority of consideration when applying for the position of XAO after leaving the station. f. For those who apply for post-doctoral by entrusting training, directional training, on-the-job training and person active military service, must submit the certification of agreement from unit they belong to. (2) Applicants whose application materials have been examined and qualified will notify themselves by telephone or mail. The application materials will not be returned to those who have not passed the examination. Dealing with molecular clouds, galactic media, star formation, etc. Both theorists and observers, with expertise in any of those subjects: Optical Time-Domain Survey, Photometry and Spectrum Data Analysis, Optical and Radio Follow-up of Transient Events, Pulsating Variables, Cataclysmic Variables, Supernovae, Stellar Flares ,Binaries, Exoplanets.